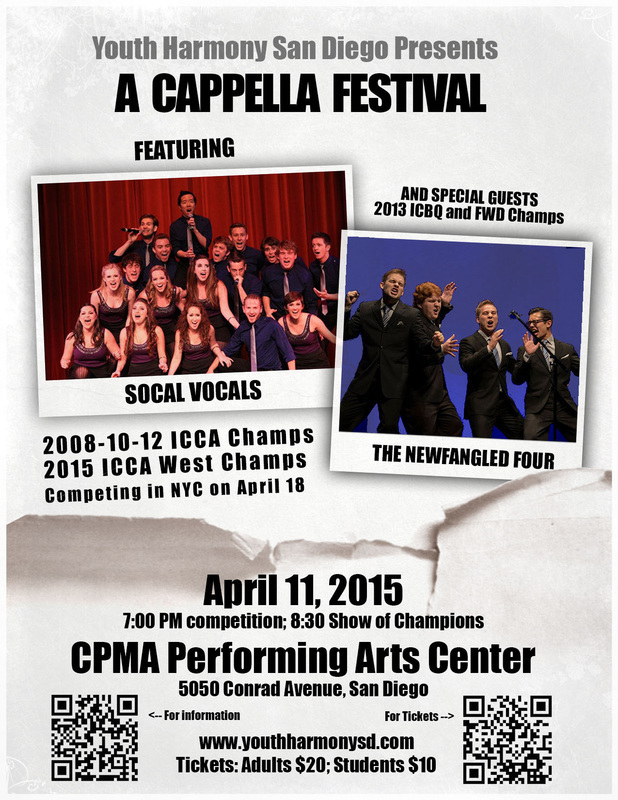 Make plans to attend the inaugural San Diego A Cappella Ensemble Showcase on April 16, 2016, at the Creative, Performing and Media Arts Middle School's new Performing Arts Center, 5050 Conrad Avenue, San Diego. This event was a smashing artistic success on April 11, 2015. Check out the results and video here. The event will consist of a 2-hour competition starting at 6 PM followed by an evening concert at 8:30 PM. The competition is open to all secondary school and college choirs and ensembles that sing a cappella in San Diego County. Cash awards will be won by top contestants. Check out the event flyer below (Fact Sheet included) to find out what it's all about. To apply, register your group below. If you have questions or would like to know more, please contact us! We have booked two fabulous headliners for the evening show: four-time winner of the International Competition of Collegiate A Cappella (ICCA), SoCal Vocals, and 2013 International Collegiate Barbershop Quartet Champions, The Newfangled Four, who also won the Far Western District quartet championship later that year. Audience members are welcome to attend both the competition and concert. You will have the opportunity at intermission to vote for the audience favorite. The evening show, featuring our headliners, will also showcase the winners of the competition and the audience favorite as well as our own San Diego Young Men's Chorus, Pacific Suns. See the event flyer below for information about the evening show. For tickets ($20 for adults; $10 for students), order them using the button below. Competitors need not purchase tickets.